I found cute chocolate transfer sheets at DAISO (Japanese dollar shop)! I had no idea but bought them because I wanted to use them for something. 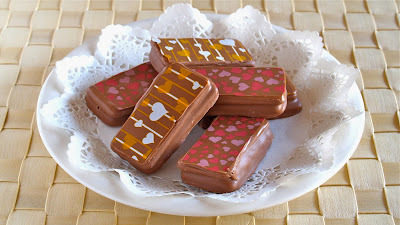 After thinking for a while, I came up with a great idea using "Tim Tam"!!! To use the chocolate transfer sheet, you will need sweets with flat and hard surface, covered with melted chocolates… Tim Tam is just perfect for that, especially the double coat one! 2. Insert a toothpick into a Tim Tam. 3. Heat a frying pan, stop the heat, then melt the surface of Tim Tam with the remaining heat. 4. Place the transfer sheet on the melted surface before it hardens. Make sure that there are no bubbles in between the sheet and the chocolate. 5. Chill in the fridge or freezer until firm. Carefully peel off the sheet and remove the toothpick.